Schools have been put on alert after 'threatening' emails were sent warning of an attack. Schools in the North East have been put on alert after staff reported that they have been sent "threatening" emails. Police have confirmed that forces across the country have reported similar incidents. The emails are believed to have informed schools that they will be targeted in an attack later today. Parents are being asked NOT to call police as officers are in contact with schools at present to offer advice. Chief Inspector Catherine Clarke, from Durham Constabulary, said: “We can confirm that at this time we believe none of the threats received by schools to date are considered to be credible. “In the absence of any further threats being received, schools do not need to take any further action. “If any further threats are received they should be reported immediately to police. “We are in contact with the schools in our area to give guidance and reassurance. “More than 100 schools in the North-East region have received the emails and we are working with neighbouring forces to establish the facts and investigate who is responsible." 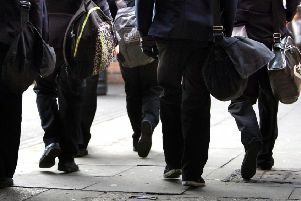 A Northumbria Police spokesperson said: “We are aware of malicious communications that have been sent to a number of schools in our region and this is being treated as a hoax. “There have been a number of reports of the same email being sent to schools across the country. "Police take hoaxes extremely seriously. They divert police resources and cause disruption and alarm to the public. “Our officers have been liaising with affected schools in the region to offer reassurance and highly visible patrols will continue as normal throughout the day. "Enquiries are ongoing to establish the facts and forces are working together to investigate who is responsible." A Sunderland City Council spokesman, said: "We are aware of reports of malicious emails being sent to schools across the country. "So far we are only aware of emails being sent to a handful of schools in Sunderland. "Northumbria Police have advised that the emails are being treated as a hoax and that while enquiries are being carried out by counter terrorism specialists, they do not believe that there is any credible threat to schools in our region, or any schoolchildren. "Schools and staff have been made aware of the hoax emails and police are liaising with schools to offer reassurance." Durham County Council meanwhile tweeted: "A number of Durham schools, along with others both regionally and nationally, have today received a threatening email, which we have referred to police. "Officers will be contacting all schools who have been affected to offer further advice and reassurance." Anyone with any information that could assist police should contact their local police force on 101, or Crimestoppers anonymously on 0800 555 111. A spokesman for Cleveland Police, said: "We are aware of schools in our area reporting that they have been sent threatening emails. "Police forces across the country have also reported similar incidents. "The emails inform the school that they will be targeted in an attack later today. The emails are not believed to be credible and parents are advised to pick up their children from school as normal. "We wish to reassure parents and schools that enquiries are continuing to establish the facts and forces are working together with national agencies to investigate. "We are requesting that parents do not ring the police as we are in contact with the schools to offer advice and reassurance, and to keep them updated on the investigation. "We take all incidents of this nature extremely seriously." Schools in the North East have been posting details on their Facebook pages. Ropery Walk Primary School in Seaham released a statement saying: "Every school in the county has received an email issuing a threat to the children at the end of the day. "Advice from the police is to carry on as usual. "All staff will be on the yard at home time. "All staff and parents need to be extra vigilant."